Weekdays: 10 a.m. to 7 p.m.
Haverford College campus on Haverford Road June 10th-16th. This golf course has special significance to Philadelphia and to golfing lore. 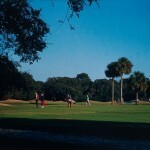 It was here in 1930 that Bobby Jones won the US Amateur Tournament, completing his grand slam. The only golfer to come close to this feat since then was Tiger Woods when he held all four major professional golf championships in 2000- 2001.
studies and Evans for his documentation of the human condition. 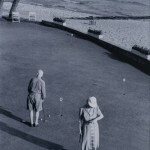 These differences in approach are manifest when their photographs of golf are seen side by side. Similar questions are raised by golf as a game and as a sport. Is it a recreational activity or a sport requiring rigorous physical and mental training? 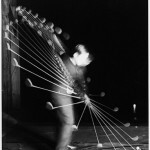 Edgerton invented multiple flash stroboscopic photography and used it to answer a fundamental question of golf: “What happens during the ‘click’—that all-important event when the club imparts its energy and the skill of the player to the ball?” The photograph of Bobby Jones’ golf swing is a scientific record. The exposure of the negative at 1/100,000th of a second reveals a swing that is compact and rhythmic, a hitch or hesitation in Jones’ swing would be clearly visible in the photograph. 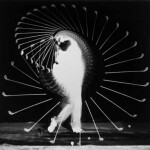 Ultra high-speed photography has become the norm for sports training and motion study today but in 1938, when Edgerton photographed Jones and other championship golfers, it was a first. 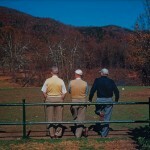 photography to express their interest in the game, which makes it possible for non-golfers to understand its allure. 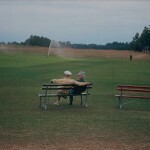 Their photographs are some of the most original made of golf and golfing. These rarely seen photographs will be displayed along with the artists’ publications and writings on the subject.